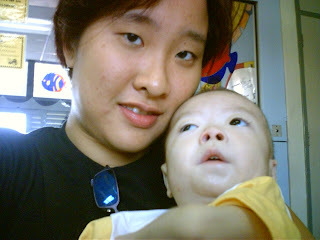 First of all, she assumed I was the mother of this child, second of all, in assuming I was the mother, she assumed Chee Keong was the result of some hanky-panky (out of wedlock), and thirdly, even if she was right in her first two assumptions, does that mean I (anyone, for that matter) deserves to be 'punished' with a handicapped child? A few weeks later, this time, a Chinese lady in her fifties decided to come and tell me off...She said (in Malay! ): "Mak sepatutnya tinggal dengan anak di hospital tahu? Anak sakit, macam mana kamu boleh balik rumah? Duduk dengan anak lar. Kenapa buang sini? Siapa mau jaga? Tak ada hati ga? Mak tak guna"
Yet a few weeks later, an Indian lady, a grandmother of 4, came and gave me a piece of her mind...She told me: "Tahu kenapa lu punya anak cacat dan kurus ka? Sebab, kamu tarak bagi dia minum susu ibu! Kenapa tarak bagi dia minum? Mak tarak ajar ka? Dengar saya cakap. Bagi dia minum lu punya susu". Muhibbah, no, all those who came and made noise? Why can't people just ask if they're curious? I wonder, would it have made a difference if I had been of the same age as them? Would they still tell me off? And how come I don't get all this when I was dressed properly (with no tag)? I believe he has made me a slightly better person, and there were sweet moments with respect to the public too, like this sweet Malay+Chinese+Italian+Dunno-What-Else lady who quipped: "Comelnya your baby, and sooo putih! Hubby Mat Salleh yeah?" To punish without investigating, at least to me, is very much unacceptable! Work the same with putting the blame on innocent child. Judgemental has becoming more of a culture, and I'm telling you; No good! Glad you are not hot-headed kind of lady. Certain people simply go mad with all this. Some people are like that... they passed judgment whimsically and righteously as if they never do anything wrong or sin should I say, in their lifetime. I sincerely admire you, not only for the work you do but also for the dedication and compassion you put into it. I love reading your blog and I have to say, looking at it from your perspective, indeed it's a learning experience for readers as well. Cheers to you! You got a big heart girl. It takes guts not to mention compassion to undergo what you went through and you did. I am sure you have gained heaps from the experience. Looking after Chee Keong whom you are very fond of, I gather, was never easy. Never mind the comments - everyone loves to judge and preach righteousness. Its what is in the heart that matters. "Some people are like that", as Bitta said. They rather see the speck in other people's eyes than a log in their own. I too wonder if those women's reactions would have been different if you were dressed "up" or was of the same age group as them. I suppose their approach would have been different. Yep, that's the kind of mentality many of our people still have. Without even bothering to ask, they simply come up with their own conclusions. They could have asked nicely, but instead they simply shot you. I guess dressing does play a role in people's judgment. I remember visiting a client at the hospital once. Just as I was looking around trying to find my client, I overheard a nurse asking her colleague, "Ustazah ni cari siapa?" Not bad u kept ur cool...if it was me....'hell to pay' for making ignorant comments. Well, what goes round comes around. I would definitely refrain myself from uttering that kind of careless remarks after this... yup, must throw away that tendency. Dont want to be that mak cik "kepoh." Thanks for that lesson for today. There's all kinds of people in the world and I don't know these people you mentioned deserve to be forgiven on judgment day. I think you got a real strength of character to take all those unnecessary abuse in stride. In the course of SERVICE to mankind and doing GOOD WORKS, I might add. Keep on fighting the good fight, sis. you are such a wonderful gal. if i were you, i wld have called them 'busy body' for their comments. keep cool & be patient. Never in my life met a kind hearted gal like you who's willing to spend time doing charity tasks. keep up the good work. u know wat? I always admire ur strength volunteering to take care of handicapped child like chee keong, but after reading this post, I fell in love with u! God bless u...n chee keong ofcoz! I was shocked that people can put 2 and 2, and come out with 56739! Too shocked to even give her a retort! The main reason I was angry was because it was absurd that a child should pay for the 'sins and wrongdoings' of his/her parents...You're telling me Chee Keong deserves to be born the way he is? Hey! I went over to your profile the last time you left your tracks, but you have so many blogs! Which exactly is your main one (Bitta's Den)? I think this judgement thing is very much part of our society...This is where gossip comes in, isn't it (I'm guilty too here)? Thanks for coming by Bitta, and hope you have a nice day! You're right, about the heart...But sometimes the mouth says things the heart means not, so people with lazer mouths can have beautiful hearts too! Ouch! That muhibbah judgemental comments from the grandmas of 3 major races in Malaysia is grossly unfair( even to Chee Keong's mum).But thats what you see everyday. People(not only elderly)most likely will have their own assumptions as their first impression on situations they see. Like Akmal said, it has become a culture.Malaysian culture. If someone is very ill and bedridden and losing weight..what will be peoples first reaction? Oh...that so and so have AIDS. I'm hoping I will not fall into that category in a few years time.Pray for me meh! ps-Are you a registered voter? As for the dressing and age, I think if I had been more 'classy and old', they wouldn't have dared to address me at all? Cos same age means I can yell back at you! Hehe! "Separuh tiang" ah? Hahaha! Maybe she called you Ustazah because of your tudung labuh aka flying nun ;)? "Hell to pay" huh? Cannot lar for me...Firstly, they're all old...Secondly, I was under the hospital lar...How would it look if I kept blowing my head off at the visitors? I think it's not wrong to be kaypoh lor...Aren't we all busybody's in different ways? I am very kaypoh by nature, you know...Some people call it inquisitive...=) We can be 'inquisitive' together! But it adds flavour to life! But I guess the elderly don't believe or don't know the existence of genetics? So they blame it on 'karma'? for being late, i shall reserve from saying anything as everybody has said their piece. i'm with all. you enjoyed your time with the 'old Man' and thats what mattered. cant tell the old ladies to screw off, can i? we cant control what others do/say/think but we can control what we ourselves do/say/think..
"We cant control what others do/say/think but we can control what we ourselves do/say/think.."
Bravo! Another gem from you, and you're very right..
Hi Daphne, yep that's right, my main blog is Bitta's Den. Sorry about that, goodness me, didn't realized all my blog title showed in there. Wonder how to make it invisible, it's just stuff for my indulgence. By the way izit ok if I add you to my favourite bloggers? Pliiz. Daphne, some ppl memang have the habit of cakap ikut sedap mulut without even care to find out the truth or help. Im sure theyd all be singing a diff tune if it happens to them. sigh.. Well, wht goes around comes around. NO NO! Haven't popped yet! Just been too tired to blog hop! I think dear Chee Keong has made you a much much much much better person..a lot more than you think! If anything, you're definitely a much stronger person! Thanks for the vote of confidence Mott...And you're right...The time spent with Chee Keong has made me a stronger person...Most definitely! Hi Daphne, Hahaha.. thanks, I figured that out somehow, tau lah ni old school bloggers bah. Oh goodie.. I'll go and add you right away. As for me tak sampai hati nak kata macam tu. Never came across my mind in using such hateful words. Anak being cacat is no one fault. I have down syndrome baby boy well he is no baby anymore he will be 2 in a few days. I am telling you he is the most wonderful thing that happen to my life besides my husband and my other two beautiful children, friends and families. Everyday is a fresh day with him around. To be honest I never blame anyone or myself or even God in that matter for him being Down Syndrome. I take is as a anugerah from God almighty. Never a day without a smile on my face and everyone's face everytime my husband and I bring him out to the restaurant, playground and Church. He has this some kind of magnet of love in him. Everyday is a new fresh day with him. He is full of joy not just for us but also for others. And yes, I do remember mamak...And teh tarik also! Hey Daphne got your reply message. Try to email you but failed but anyway thank you so much for taking your time in replying my comment on sweet Chua Chee Keong. I look at him I see my son. 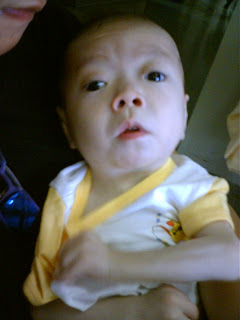 I could not help myself from crying after reading about sweet little angel Chee Keong. I look at him I think of my son not sure what would I do if something happen to my son. You are his earth angel, you have done super super job in taking care of him and share your love with him. He knows it. He knows his mummy. He is up in heaven now with God and I do believe he is watching over you and the rest of the unfortunate children. God loves him so much and he is in a good place and in a good hand. Thank you for the wonderful uplifting words. To be honest I do feel special. And yeah, they change your life in a very good and positive way. Definitely help us to see things from their point of view and you are right that is a blessing...and it is a blessing to you too to have had Chee Keong in your life though only for a short while and the love and the caring you gave him means a lot truly shows your true self. You are a good person and you have a big heart. Hang on to it and continue to be strong. Thank you once again for replying back. Visit me anytime you want. and till then many blessings to you.